Better not drop your new iPhone X. If it’s damaged, you’re in for a nasty surprise: The most expensive smartphone on the market is also the most costly to repair. The cost to fix a cracked screen at an Apple store is $279. That’s significantly more than replacing a cracked screen on previous iPhone versions. If there is other damage, the repair price jumps to $549 – more than half the retail price of that phone. By comparison, the cost to repair a cracked screen on iPhone 8 is $169 and other damage is $349, according to Apple’s repair pricing page. And consider this: While Apple says the iPhone X has “the most durable glass ever used in a smartphone,” several durability tests have found that it’s easily damaged. The high price to repair the iPhone X is due to its sophisticated technology. It has a glass front and back, a smaller logic board, and a split battery that are all more difficult to remove. The front screen is a thin and expensive OLED display – the kind used in high end TVs – that has extra functionality built into it. The camera is embedded into the screen -- so if you break the glass, you have to replace the camera. “The face of the camera, used for the facial recognition technology, is embedded into that front screen,” Bree Fowler, smartphone editor at Consumer Reports, told NBC News. “So if you just break the glass on the screen, you're going to have to replace that camera, too.” In other words, with the iPhone X, if the screen is seriously cracked, you may not be able to skip repairing it, as you can with other smartphones. Apple did not respond to a request for comment by NBC News for this story. So how easy is it to break? The iPhone X, with its glass front and back, has two vulnerable surfaces. Consumer Reports has completed limited tests on the iPhone X – a series of standard drop tests from five feet. It survived all four tests – face, back, and two corners – with “just a few minor scrapes,” the editors write. The magazine hasn’t tested the durability of the X yet, but the iPhone 8 and 8 Plus survived CR’s specialized tumbler – which dropped the phones the equivalent of 2.5 feet onto a hard surface 100 times – with just minor scrapes. 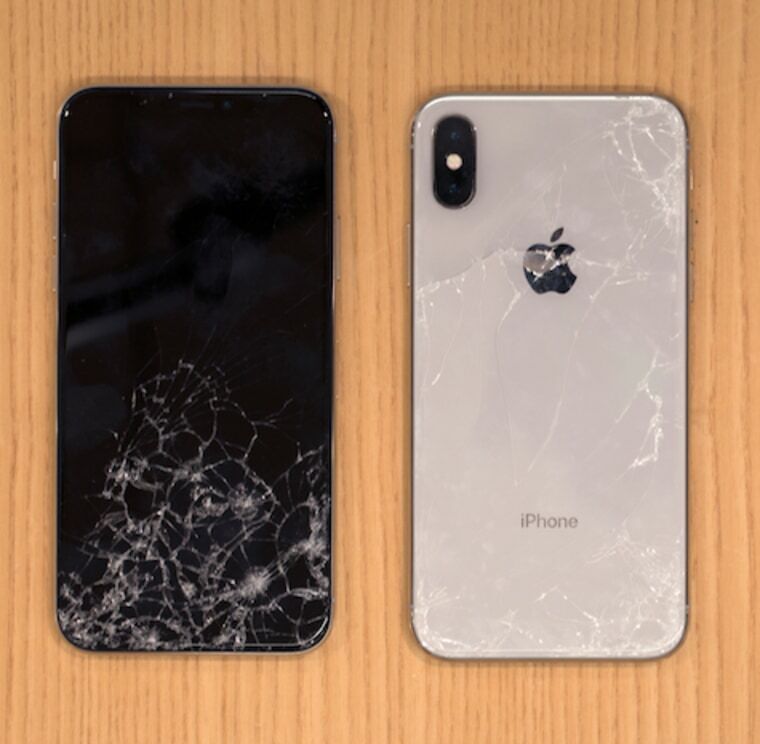 Square Trade, a company that sells extended warranties for electronic products, also tested the X and found it to be the “most breakable” iPhone it’s ever tested. It scored 90 out of 100 points, making it a “high risk” model. The iPhone 8 scored a 67 (medium risk); the iPhone 8 Plus a 74 (medium-high risk). Related: Is the iPhone X as good as it gets for Apple? Prior to the iPhone X, SquareTrade had named the Samsung Note8, which scored an 80, “the most fragile phone” on the market. SquareTrade uses a series of standardized tests done by machines to rank the durability of new smartphones: Face down drop, side and back drop, dunk test, shot test (which simulates a phone flying off the roof of a car) and ability to repair. While dropping a phone from six feet is not realistic, the test is the same for all models. The phone failed the first face-down drop test: The glass shattered, the display was unresponsive and the Face ID didn’t work. Another X stopped working when it was dropped on its side. The 60-second tumble test resulted in shattered and splintered glass, and the failure of the home swipe and Face ID. A sturdy case is essential for any new smart phone – it will reduce the chances of serious damage. But should you shell out another $99 - $199 for an extended warranty/insurance protection plan when you buy the iPhone X? “Anyone who can afford to spend $1,000 on an iPhone X can afford to pay to have it fixed if they break it,” said Edgar Dworsky, founder of Consumerworld.org. “For those who know they have butter fingers, and because of the greater likelihood that the iPhone X will suffer damage if dropped, they may want to consider the damage protection plans offered by Apple, their own carrier, or other companies,” he advised.